Scene@ "Gertrude Stein and Fascism"
Ilsley Library, Middlebury, Wednesday, October 3, 7 p.m.
With seating for 75, the Community Room was more than half full by the time Dartmouth College associate English professor Barbara Will began her Vermont Humanities Council First Wenesdays lecture. Maybe it was the word "fascism," more than the prospect of talking about a famously difficult American Modernist writer, that had drawn people in, Will acknowledged at the start. Or maybe it was the recent rediscovery of another Jewish woman writer living in World War II France, Irène Nemirovsky. The Suite Française author had converted to Catholicism and written vehemently anti-Semitic tracts, but died in a concentration camp nevertheless. Stein, a fan of Catholic saints but still a Jew, lived out the war untouched in a small town in southern France, surrounded by her "degenerate" Matisse and Picasso paintings. The question has always been, how? - not to mention, why? 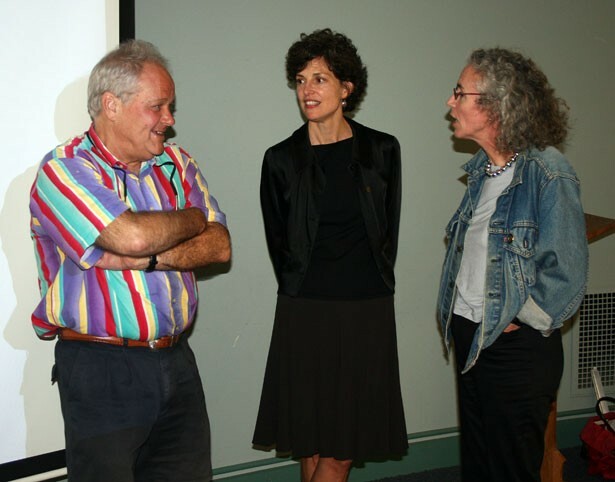 Will, dressed head-to-toe in black, with the height of a runway model and the charisma expected of a winner of Dartmouth's outstanding teaching award, pointed out that Stein had been writing for 30 years in France before she first won public acclaim. On a lecture tour of America in 1935 following the success of The Autobiography of Alice B. Toklas, adoring audiences suddenly gave her a taste of what it was like to sway the masses. Those famous statements of Stein's, "Hitler should have received the Nobel Peace Prize" and "The majority does want a dictator," can't be entirely written off to irony, Will suggested. And since Stein's efforts to translate Vichy head-of-state Philippe Pétain's speeches for publication in America were found 10 years ago in a forgotten Yale archive, Stein may just have to join the ranks of Modernist artists peculiarly drawn to "the third way" - and Jewish intellectuals who thought the unthinkable. Doubters can read Will's full argument in her book, due out next year.